The Xiaomi Redmi 5A was launched on the 16th of October 2017, just some few months after the unveiling of the Redmi Note 5A. The phone has the same price as the Redmi 4X that have been on sale for a while now. The good thing about this newly launched phone from Xiaomi is that it is affordable and cheap, so if you are looking for a smartphone that won’t hurt your pocket, then the Xiaomi Redmi 5A should be a best buy. Set your eyes in its full specifications, features and price. Xiaomi Redmi 5A Features With the affordable Xiaomi Redmi 5A, what you will get for your money is a 5inch touch screen with a resolution of 1080 x 720 pixels and a 294ppi. It is powered by a 1.4GHz quad-core Snapdragon 425 processor coupled with a 2GB or RAM. It also boast of an internal storage of 16GB that can be expanded up to 256GB via microUSD. The camera of the Xiaomi Redmi 5A is also cool as it packs a 13MP camera on its rear panel and a 5MP camera at the front for taking selfies. The Xiaomi Redmi 5A came running on the Android 7.1 Nougat operating system out-of-the-box, and it will be powered by a 3000mAh non-removable battery that guarantees long lasting usage when used moderately. It has a body dimension of 140.40 x 70.10 x 8.40mm and weigh 157g. The Xiaomi Redmi 5A is a dual SIM (Nano SIM) smartphone and its connectivity options include; Wi-Fi, Bluetooth, GPS, USB OTG, FM, 3G and 4G. Sensors on the device includes proximity sensor and accelerometer. 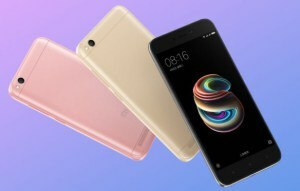 The Xiaomi Redmi 5A price is quite affordable as it goes for just CNY 600 in China, which is approximately $91 in United States and /€77 in European countries, gong by the current exchange rates. Pre-orders in China kicks off today, the 16th of October 2017 and it will be on various online stores like Xiaomi Mall, JD.com, Lynx and others.